1 XV REGIONAL CONFERENCE ON MIGRATION REGIONAL SEMINAR ON MIGRATION AND FAMILY COLEGIO DE LA FRONTERA NORTE APRIL 2010 DRUG ABUSE, MIGRATION, COUPLES, PARENTHOOD, FAMILY D R. R ICARDO S ÁNCHEZ H UESCA C ENTROS DE I NTEGRACIÓN J UVENIL A.C C ENTROS DE I NTEGRACIÓN J UVENIL A.C.
3 … painfully, he says [as told by the wife]… Im leaving, children, you see that I have no job, and I have this chance… To see if I could help my children get ahead Pérez, I.V., Díaz, N. B., Arellánez, H. JL. 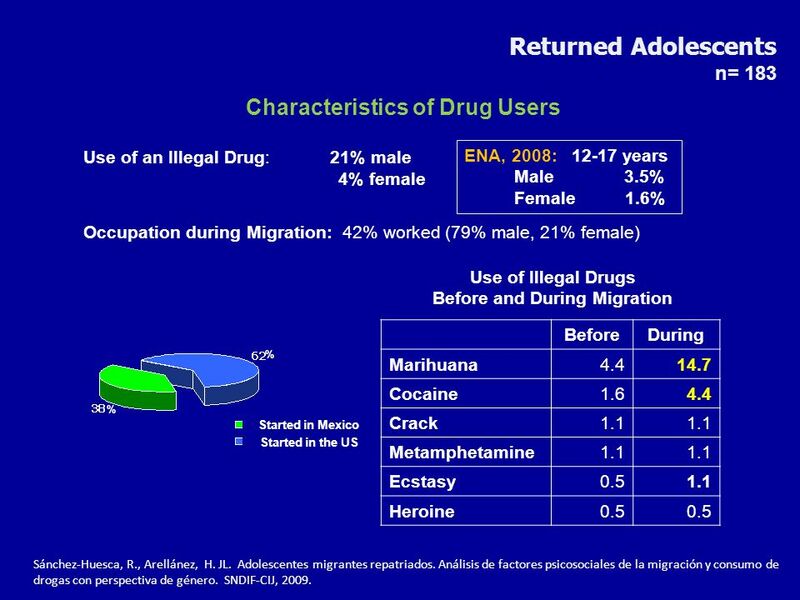 Impacto de la emigración del padre en la conyugalidad y parentalidad en familias de jóvenes usuarios de drogas. CIJ Internal Paper, 2004. 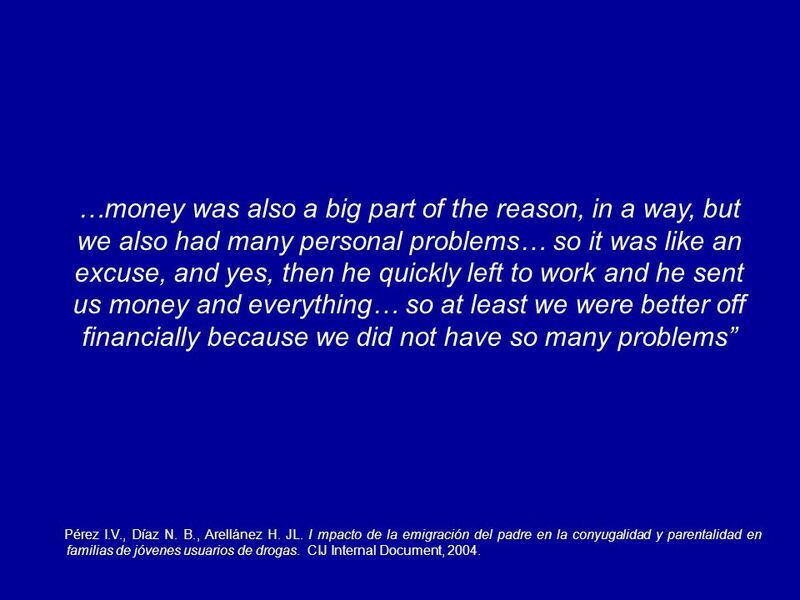 4 …money was also a big part of the reason, in a way, but we also had many personal problems… so it was like an excuse, and yes, then he quickly left to work and he sent us money and everything… so at least we were better off financially because we did not have so many problems Pérez I.V., Díaz N. B., Arellánez H. JL. 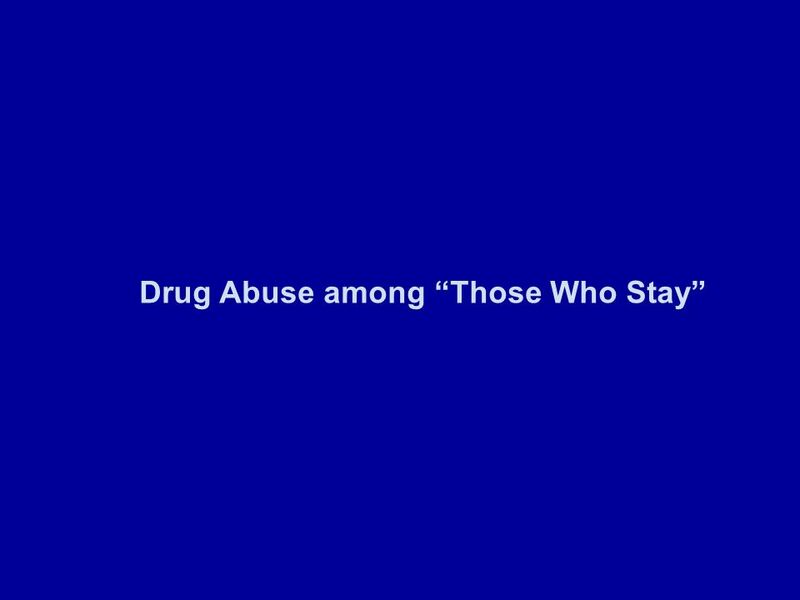 I mpacto de la emigración del padre en la conyugalidad y parentalidad en familias de jóvenes usuarios de drogas. 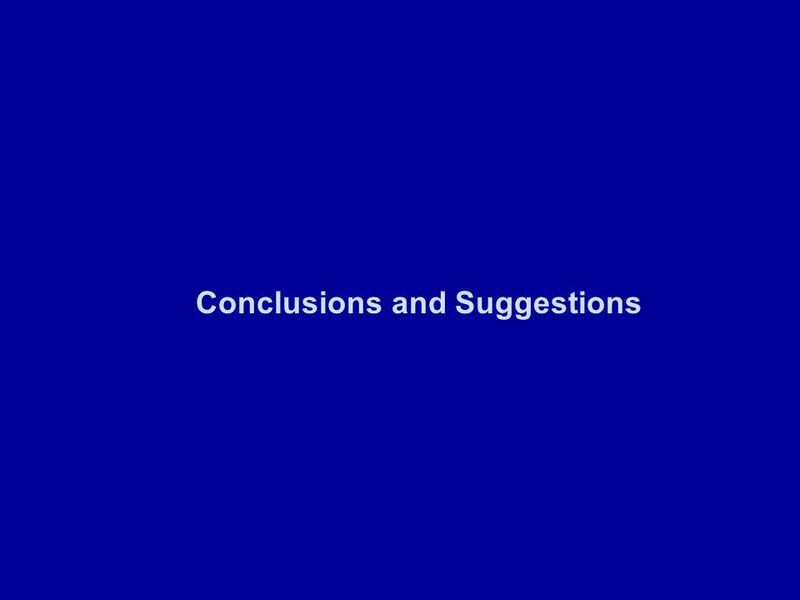 CIJ Internal Document, 2004. 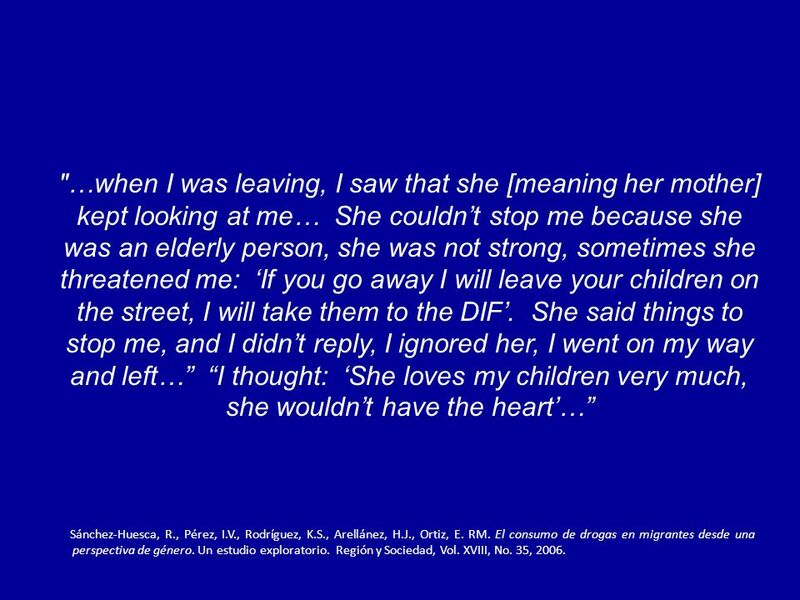 6 "…when I was leaving, I saw that she [meaning her mother] kept looking at me… She couldnt stop me because she was an elderly person, she was not strong, sometimes she threatened me: If you go away I will leave your children on the street, I will take them to the DIF. 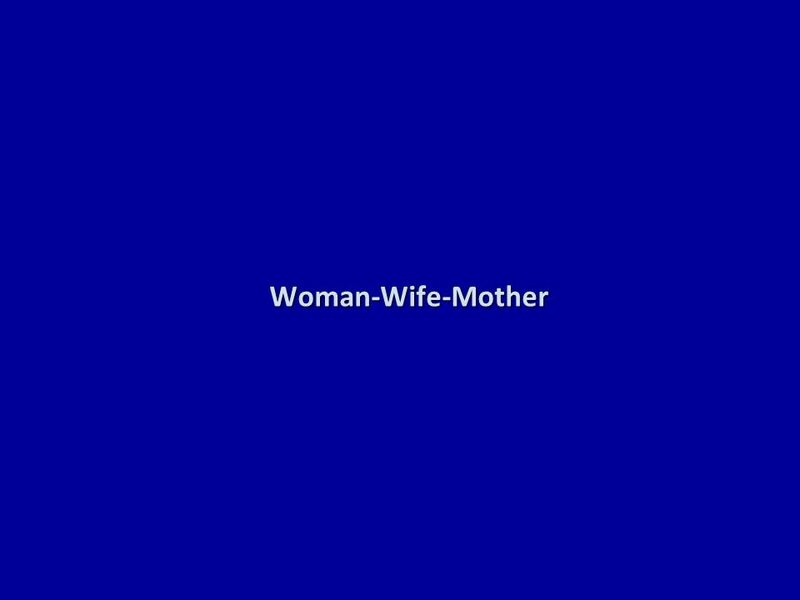 She said things to stop me, and I didnt reply, I ignored her, I went on my way and left… I thought: She loves my children very much, she wouldnt have the heart… Sánchez-Huesca, R., Pérez, I.V., Rodríguez, K.S., Arellánez, H.J., Ortiz, E. RM. El consumo de drogas en migrantes desde una perspectiva de género. Un estudio exploratorio. Región y Sociedad, Vol. XVIII, No. 35, 2006. 7 …. 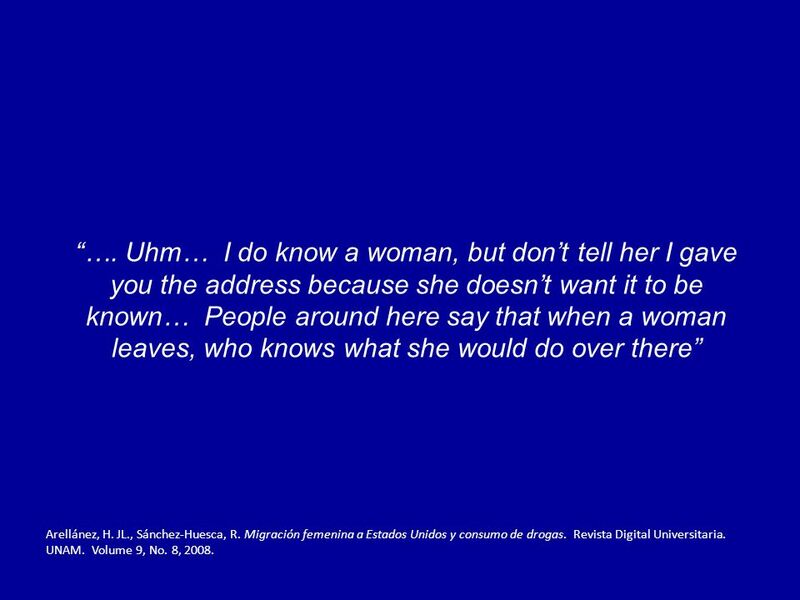 Uhm… I do know a woman, but dont tell her I gave you the address because she doesnt want it to be known… People around here say that when a woman leaves, who knows what she would do over there Arellánez, H. JL., Sánchez-Huesca, R. Migración femenina a Estados Unidos y consumo de drogas. Revista Digital Universitaria. UNAM. Volume 9, No. 8, 2008. 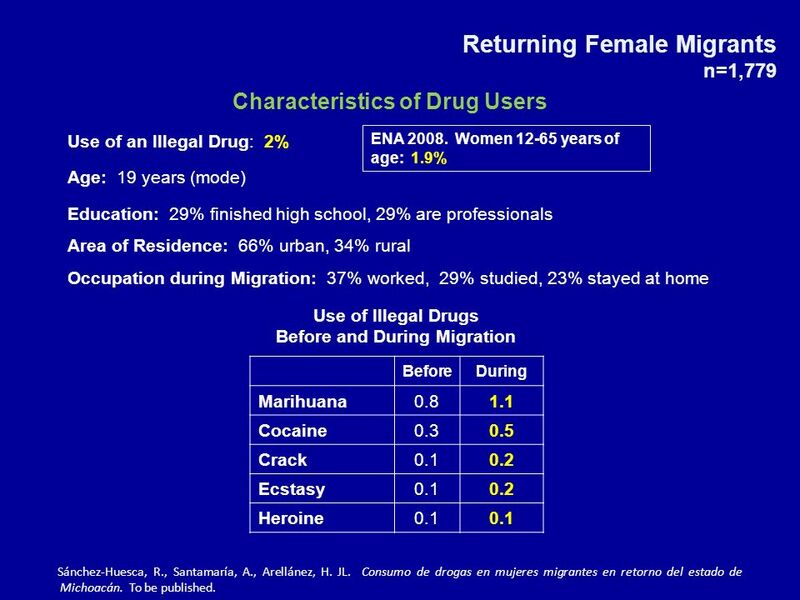 8 Returning Female Migrants n=1,779 Characteristics of Drug Users Use of an Illegal Drug: 2% Age: 19 years (mode) Education: 29% finished high school, 29% are professionals Area of Residence: 66% urban, 34% rural Occupation during Migration: 37% worked, 29% studied, 23% stayed at home BeforeDuring Marihuana0.81.1 Cocaine0.30.5 Crack0.10.2 Ecstasy0.10.2 Heroine0.1 Use of Illegal Drugs Before and During Migration ENA 2008. Women 12-65 years of age: 1.9% Sánchez-Huesca, R., Santamaría, A., Arellánez, H. JL. Consumo de drogas en mujeres migrantes en retorno del estado de Michoacán. To be published. 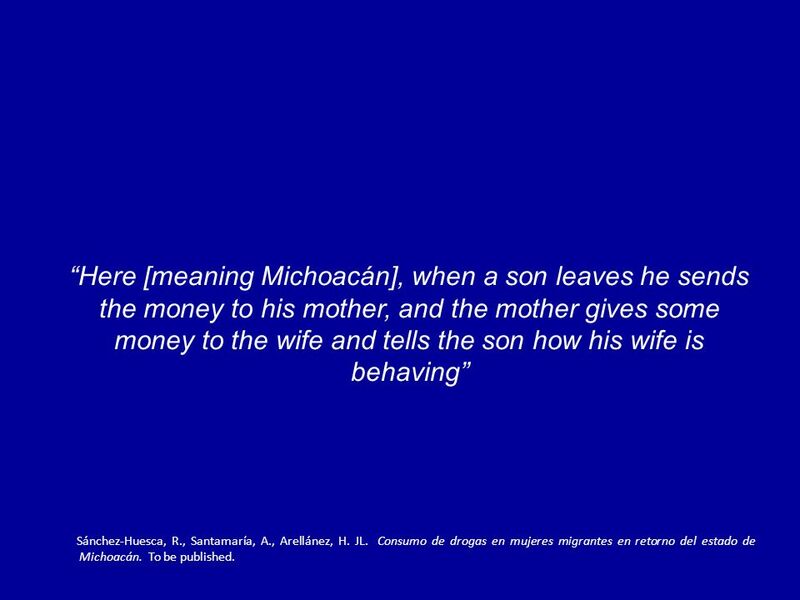 10 Here [meaning Michoacán], when a son leaves he sends the money to his mother, and the mother gives some money to the wife and tells the son how his wife is behaving Sánchez-Huesca, R., Santamaría, A., Arellánez, H. JL. Consumo de drogas en mujeres migrantes en retorno del estado de Michoacán. To be published. 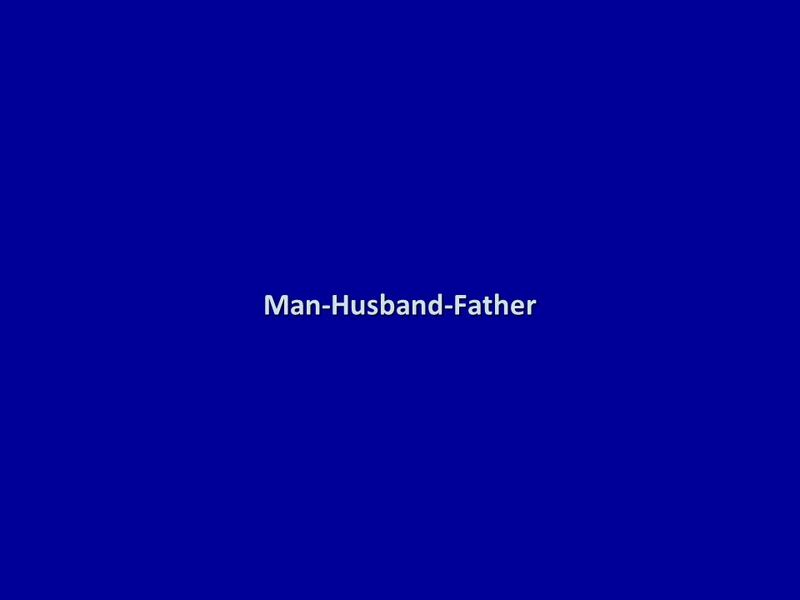 12 …because its a fact that people need a father, and they need him to be at home and to be with them. Because, more than anything, I see my friends who are with their fathers and… the family environment seems to be more relaxed, I mean, there is not so much pressure, not so much scolding… I started using everything [meaning drugs]. 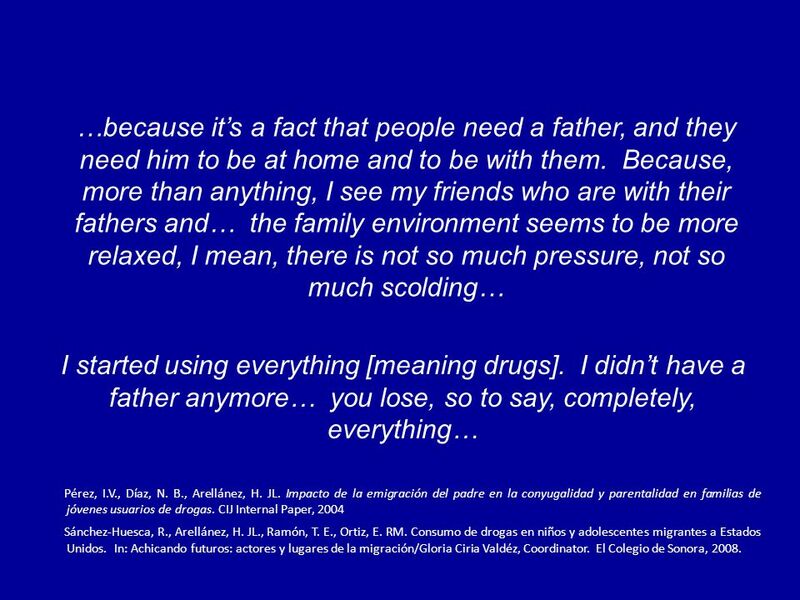 I didnt have a father anymore… you lose, so to say, completely, everything… Pérez, I.V., Díaz, N. B., Arellánez, H. JL. 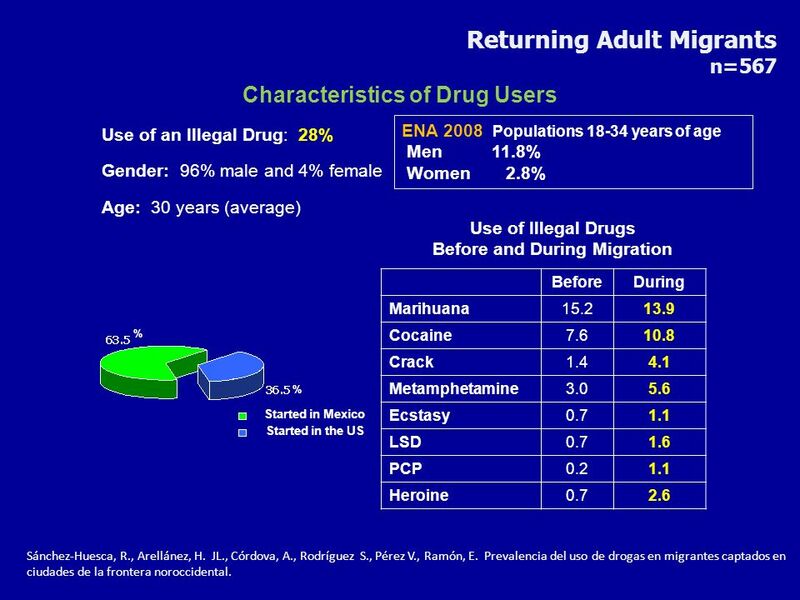 Impacto de la emigración del padre en la conyugalidad y parentalidad en familias de jóvenes usuarios de drogas. CIJ Internal Paper, 2004 Sánchez-Huesca, R., Arellánez, H. JL., Ramón, T. E., Ortiz, E. RM. Consumo de drogas en niños y adolescentes migrantes a Estados Unidos. In: Achicando futuros: actores y lugares de la migración/Gloria Ciria Valdéz, Coordinator. El Colegio de Sonora, 2008. 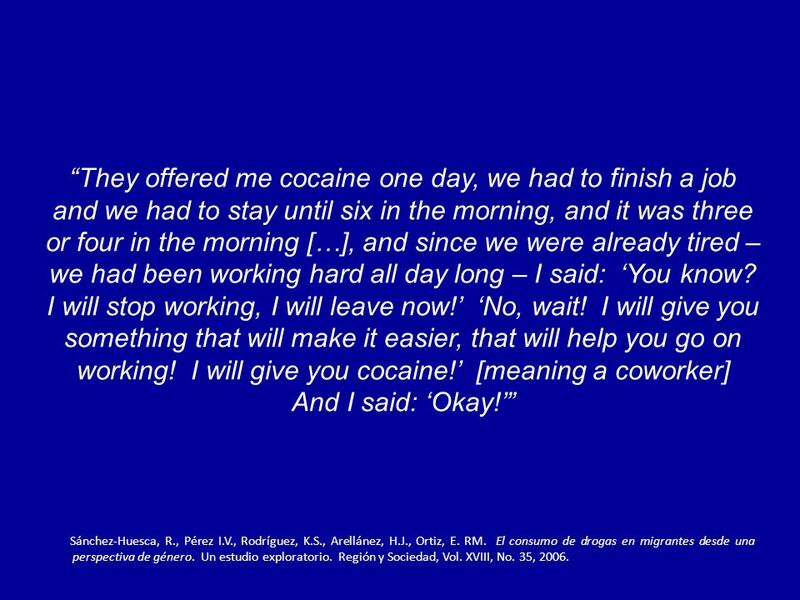 14 They offered me cocaine one day, we had to finish a job and we had to stay until six in the morning, and it was three or four in the morning […], and since we were already tired – we had been working hard all day long – I said: You know? I will stop working, I will leave now! No, wait! I will give you something that will make it easier, that will help you go on working! I will give you cocaine! [meaning a coworker] And I said: Okay! Sánchez-Huesca, R., Pérez I.V., Rodríguez, K.S., Arellánez, H.J., Ortiz, E. RM. 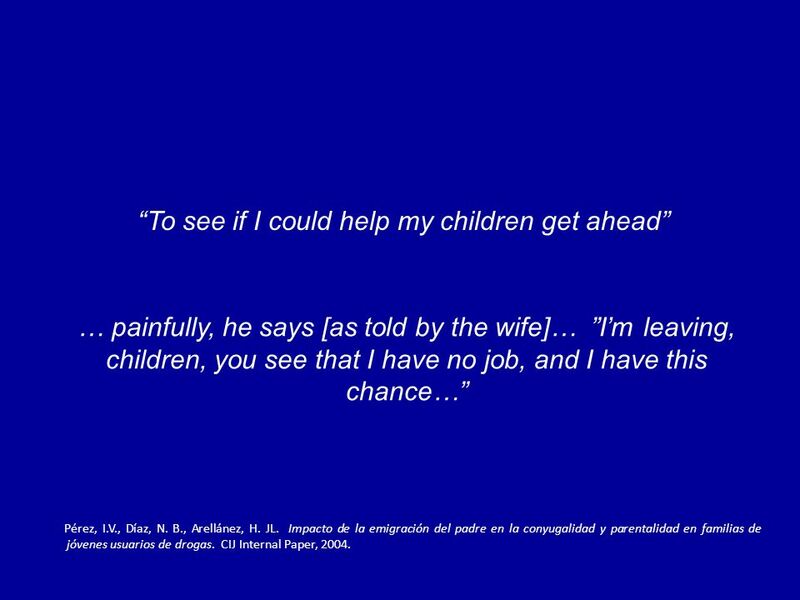 El consumo de drogas en migrantes desde una perspectiva de género. Un estudio exploratorio. Región y Sociedad, Vol. XVIII, No. 35, 2006. 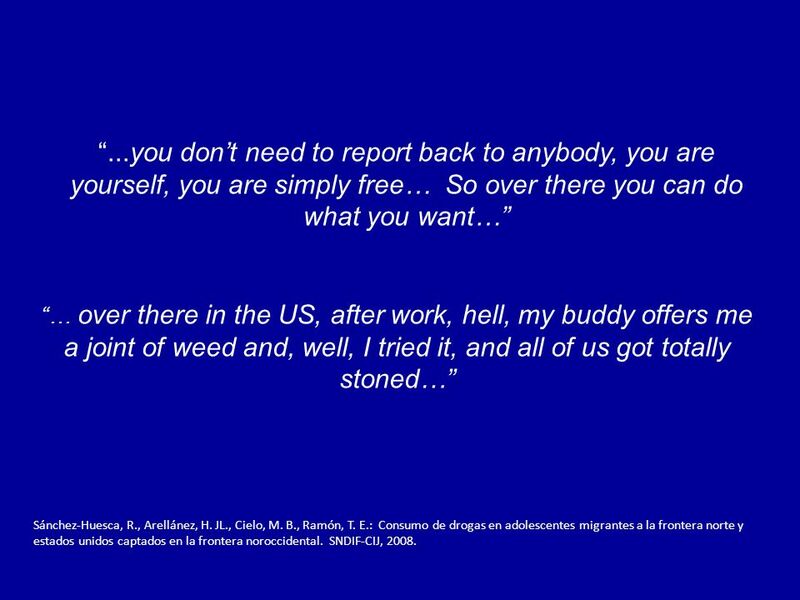 17 ...you dont need to report back to anybody, you are yourself, you are simply free… So over there you can do what you want… … over there in the US, after work, hell, my buddy offers me a joint of weed and, well, I tried it, and all of us got totally stoned… Sánchez-Huesca, R., Arellánez, H. JL., Cielo, M. B., Ramón, T. E.: Consumo de drogas en adolescentes migrantes a la frontera norte y estados unidos captados en la frontera noroccidental. SNDIF-CIJ, 2008. 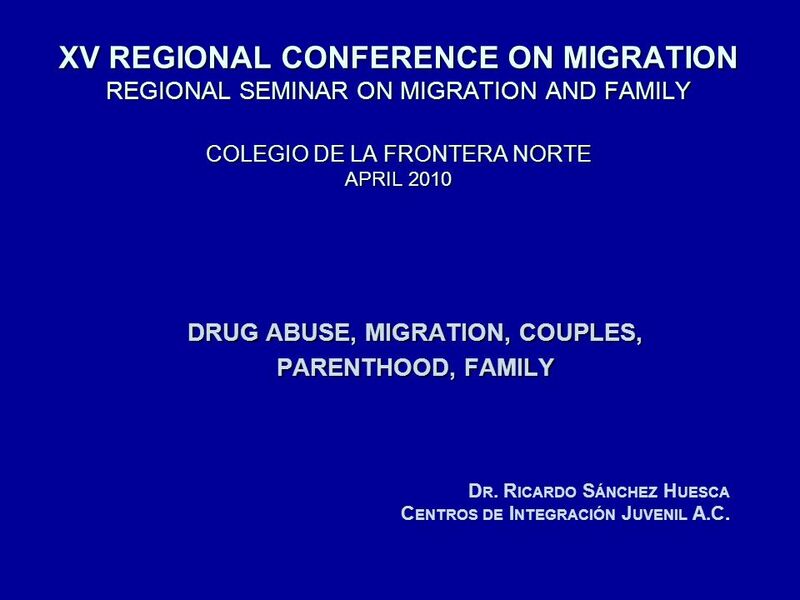 Descargar ppt "XV REGIONAL CONFERENCE ON MIGRATION REGIONAL SEMINAR ON MIGRATION AND FAMILY COLEGIO DE LA FRONTERA NORTE APRIL 2010 DRUG ABUSE, MIGRATION, COUPLES, PARENTHOOD,"
Unidad 11. When my aunt and uncle arrive, they will bring presents. Cuando lleguen mis tíos, traerán regalos. In case there is an emergency, leave the.